A little while ago I had one of my watercolours digitalized. 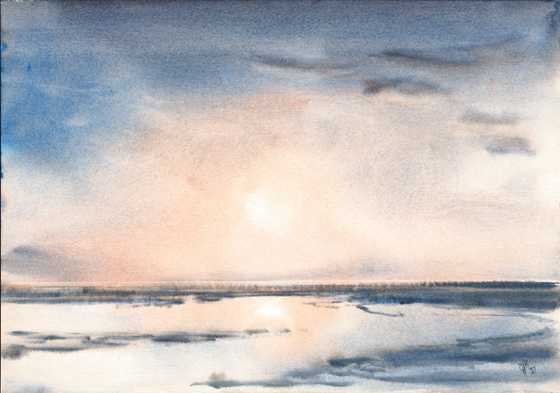 It depicts "Boschwad, below Rottumerplaat", 14x20", and you may already have seen it accompanying the Dutch article that got published in the Waddenbulletin. If you would like to see this watercolour in full screen size, then simply click one of the links below. If you have the "Active Desktop" installed (comes with Windows 98 and Internet Explorer 4), or do not work with Windows at all, you might want to install one of the JPEG-images on your desktop. The links below load the images in a new window, and when you right click on the fully loaded image, and choose Use as background (or Set as Wallpaper) everything should be set automatically. Bitmap versions are also available for users of earlier versions of Windows and alike. Bitmap 800x562, 257kB | Bitmap 1024x719, 419kB, both come with a user guide.